According to the artists2events.co.uk website "Following up The Combine Harvester was a problem which was decided one night later a show. 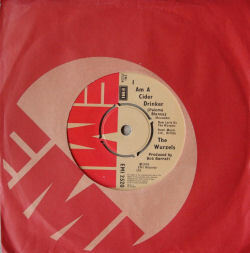 EMI Records had sent down crates of champagne to celebrate the #1 hit. 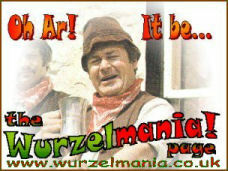 The Wurzels were kicking around with the tune of Una Paloma Blanca when Pete just came out with "When the moon shines on the cowshed" and it just went on from there. All three band members put bits in and then recorded it straight away. 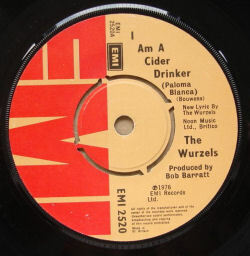 I Am A Cider Drinker rocketed up the charts, giving the group a No 3 hit and their second silver disc for sales over the 250,000 mark in a matter of weeks." 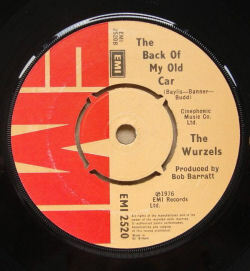 This was the first single that the Wurzels produced a promotional video for - something still rather ambitious in those days. The video - available for you to view at YouTube - was filmed in Black Horse pub in Clapton-in-Gordano in North Somerset, as well as a nearby farm. Pictured below is what appears to be an advertising poster for the single - already 'straight into the charts'! 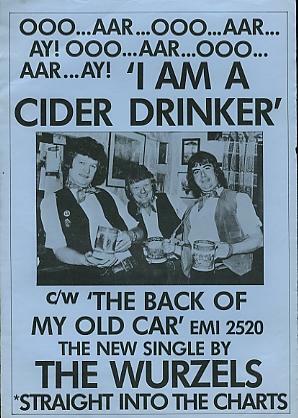 Also see I Am A Cider Drinker sheet music.